Paddy Power Bingo is the on-line bingo site from the well known Irish online bookmaker Paddy Power. The site which started in 2006 has since developed and grown into a large and friendly community of bingo players from across all of the U.K. and Europe. Bingo differs from other online gaming because of its social aspect ,and the people at Paddy power have certainly recognized that and done all they can to provide players a warm and inviting environment to play in as we’ll see in our Paddy Power Bingo. The friendly and helpful chat moderators are always there ,to keeping things buzzing. There is a onsite blog and regular updates to keep you informed of everything that’s going on, and even a horoscope page so you will know what the stars have lined up for you. Getting started at Paddy power is very quick and easy, and the 200% sign up bonuses that they offer, are among the highest anywhere on the net. This triples the amount you have available to start playing with and gives you a much higher chance of hitting the jackpot. The sites built in security software guarantees the security of all your transactions, and keeps all your personal details safe and secure. If you encounter any problem their efficient and helpful customer support service is there to help you 24/7, using either e-mail live chat or telephone. The Paddy bingo site features many extremely attractive jackpot prizes as well as a lot of other exciting promotions .You shouldn’t miss their “Saturday Night In special “ and be in line for grabbing the £500 guaranteed prizes. The site caters for all levels of players, from beginners, to the experts looking for a new challenge or an exciting tournament to compete in. For the beginners there’s an online tutorial as well as lots of free games for them to gain experience and get up to speed at no financial risk. Paddy Power Bingo is similar to many other sites in operating a loyalty point system. Here it is called the Star Rewards Scheme and player earns points every game they play, including the side games .The points that are earned build up and can then be converted to bonuses. As you progress you move up through the star levels which are called, White, Silver, Gold and Supernova. The higher your level the easier and faster you will reach your next bonus. 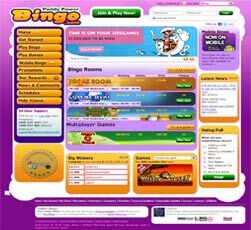 Online bingo is becoming more popular all the time and the number and variety of different sites out there can be confusing and hard to navigate. We believe that there is no need to go anywhere else .Paddy power bingo offers a great and well designed site that will satisfy even the most discerning player’s .We are sure that you will enjoy you experience at Paddy power bingo. We thoroughly recommend you to go and check it out today and become a winner at Paddy power bingo.